The Prancing Elites Project, reviewed: Oxygen’s queer dance team reality show is good for black gay representation. Ignore the Haters! The Prancing Elites Should Keep on Dancing. Adrian Clemons, Timothy Smith, Jerel Maddox, Kareem Davis, and Kentrell Collins are The Prancing Elites. 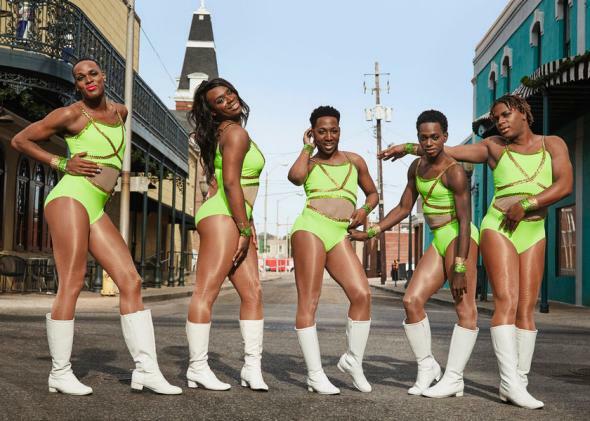 At the beginning of The Prancing Elites Project, Oxygen’s new reality series about a black gay and gender-nonconforming dance team based in Mobile, Alabama, we’re reintroduced to the squad through footage of their controversial appearance in a local Christmas parade. Headlines and footage flash across the screen painting the five-member squad as disruptive and bringing havoc to the city. Even with community members being very dismissive, the Elites continue J-Setting down the street, smiling, prancing, and throwing their eight-counts. The candid opening demonstrates that while the Elites may find joy through dance, their queerness forces them to face professional setbacks and personal hardships, all while doing the hard work of becoming more secure in their identities in a hostile environment. However, while the individual stories of the colorful and engaging cast will surely captivate audiences, the series’ larger argument is even more powerful: Everyone has the right to exist and be portrayed in the media—even if certain members of the community don’t want them to be. The first episode of The Prancing Elites follows the group—comprising Clemons, Kentrell Collins, Kareem Davis, Jerel Maddox, and Timothy Smith—as they rehearse for an upcoming parade. Although they’ve been denied a permit to participate, the squad still shows up in Saraland, Alabama, where the crowd isn’t exactly receptive to having them perform at the “family oriented” event. But rejection from public venues in the South isn’t new for the Elites. They do what they’ve always done: Make a stage anywhere they are and perform for whoever wants to watch. That doesn’t mean soldiering on is always easy, of course. While the team performs, you can hear the crowd taunting and yelling slurs like “She’s a man,” “You ain’t no woman,” and “Y’all need Jesus.” But even in the face of public bigotry, the Prancing Elites stick together and encourage each other to keep doing what they love. Indeed, it’s to the show’s credit that it does not focus solely on the negative criticism. In a particularly touching moment, a fan comes up to tell them they’re a source of inspiration, saying, “You deserve to be here and dance.” Unfortunately, not all early critics of the show have been so open-minded. To be a black gay man in America who loves to shimmy and rock sequin shorts in public is no simple matter. Even television, usually a haven for outsized personalities, is not necessarily friendly to expressions of black gayness, especially ones that lean toward the femme side of the spectrum. The Prancing Elites serve as a reminder that black gay men exist in various forms within our professional careers, family structures, and social circles—like other minority groups, we’re not a monolith. When suicide attempts are twice as frequent among queer youth of color than among queer white youth, it’s harmful and dangerous when we don’t allow people to live authentically. That’s a real issue. Before we try to discredit a show, we should think about how these images can serve as catalysts to help start dialogue among families, friends, and communities. The Prancing Elites Project can help normalize and affirm young effeminate black boys, showing them that they aren’t alone and encouraging them to find their own beat and buck down. Despite experiencing discrimination and hate from their community on and offline, this squad is adding a valuable thread to the tapestry of queer people of color on television. For The Prancing Elites, being black and gay isn’t a plot line on a reality show—it’s their life. Until we dismantle the stigma around gender roles for gay men, visibility will continue to be controversial. But in a society where black gay men are often trivialized, The Prancing Elites’ insistence on being seen reiterates the importance of boldly standing in your truth one sashay at a time. The Prancing Elites Project premieres on Oxygen, Wednesday, April 22, at 10 p.m. ET.